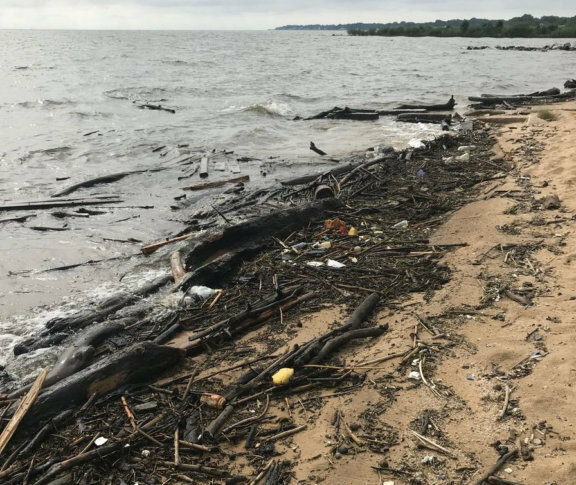 Tires, trees and other debris floating in Chesapeake Bay is why you can't swim at Sandy Point State Park, a popular beach just before the Chesapeake Bay Bridge. WASHINGTON — Debris continues to pile up on Maryland’s shores following heavy rains and rainwater runoff, forcing some beaches in Anne Arundel County to restrict swimming or to close. Meanwhile, officials are calling for volunteers to help clean up the muck. The Maryland Department of Natural Resources says no swimming is allowed at Sandy Point State Park, a popular beach just before the Chesapeake Bay Bridge, due to safety concerns after lots of debris washed ashore, including tires and trees. The park will remain open for activities outside of the water. The sandy portion of the beach will remain open and shoreline fishing is allowed there. Boaters may continue to launch but should use extra caution out on the water. The department put out a call on social media for volunteers to help clean up the debris. There will be two “large-scale” cleanups on Thursday Aug. 2 and Saturday Aug. 4. The clean-up starts at 9 a.m. but volunteers can show up whenever it’s convenient for them. Maryland DNR said volunteers need to complete an online volunteer form before arriving. Gloves will be provided but volunteers should wear solid shoes and bring bug spray. Volunteers should not bring young children. Beverly Triton Beach Park, as well as Downs Park Dog Beach in Anne Arundel County are closed. Fort Smallwood Park’s Swimming Beach and Kayak Launch also is closed indefinitely due to debris from the Conowingo Dam release. Due to high levels of bacteria found when there’s at least a half inch of rainwater runoff, the county’s health department urges anyone who comes in contact with the water to wash up immediately. Officials are urging anyone on the water in areas still open to wear a life jacket and navigate the waters with caution.